In the clear turquoise waters of the Mediterranean, there pulsates a transparent creature with a glowing red core. The ruby red is reminiscent of the legendary Philosopher’s Stone, the source of the elixir of life. This only comes to mind because this particular jellyfish, Turritopsis dohrnii (formerly T. nutricula) has the ability to shrivel into a ball when it is injured, and then revert to its juvenile form, maturing into an adult all over again. This means it is effectively biologically immortal at only the size of an adult fingernail! How does this unassuming creature pull this off? A true jellyfish. Image source a-z animals. An animal with a bell shaped body, a fringe of tentacles, and oral arms around its mouth that create the characteristic ribbons one imagines, is a true jellyfish. It is a simple animal, with two cell layers, the outer layer containing a nerve net, and the inner layer containing its digestive system, bound together by the mesoglea (similar to the mesophyll in sponges I discussed in a previous post). It cannot control its motion, and generally drifts around on ocean currents. However, T. dohrnii is not a true jellyfish. It is a hydrozoan. Another highly recognizable member of this class is the Portuguese Man o’ War, which you may recognize from this FTDM post. Hydrozoans differ from jellyfish in that they can control their movements. Cells are generally absent in their mesoglea, but a circular membrane called the velum under their umbrella helps propel them through the ocean. As they are generally much smaller than true jellyfish, they are not always visible to the naked eye. Their basic life cycle is very similar to other jellyfish. 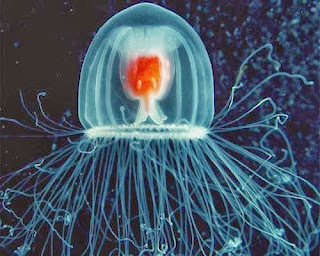 Adult T. dohrnii females spawn mature eggs into the water, where they are fertilized by sperm released by male medusae. The infant larvae produced by this are called planula, which is a term used to refer to the larval form of most cnidarian species. Medusazoan planula are ciliated, bilaterally symmetric, and unable to feed. As this planula settles down, it forms a colony which kind of looks like a tree (or coral branch). This structure, known as a hydroid, buds off tiny medusae called ephyrae, which resemble their adult forms, but are only 1 mm in diameter. They only have eight, evenly spaced out tentacles, and all of these jellies are genetically identically to the hydroid. These jellies mature and reproduce, with adult medusae possessing upwards of 80 tentacles, and this life cycle continues. Unless the jellyfish is exposed to stress, or falls sick, or gets attacked. Then things get really cool: as long as it retains some of its specialized cells from its epidermis (outer layer of cells) and part of its gastrovascular system (the inner layer of cells) it undergoes a process known as renovation and reverts to polyp, or hydroid, form. This hydroid then continues to produce genetically identical jellyfish, which can also revert to infant form when they need to, although they still often succumb to predation in the wild. Renovation is achieved by transdifferentiation of the cells. Each biological cell in our body is known as a somatic cell (as opposed to our reproductive cells, called gametes). As a cell develops, it specializes: it can become part of your eye, or perhaps your brain. In most animals, this specialization is permanent. In T. dohrnii, somatic cells can change from one type of cell to another. When the jellyfish reverts into a blob-like cyst form, its cells dedifferentiate and then redevelop. Nerve cells can become sperm or eggs, muscle cells can become cnidocytes. 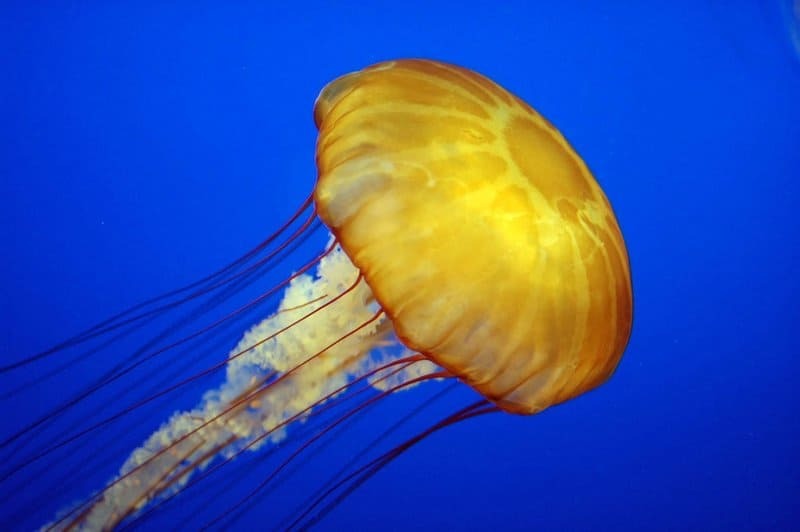 So, although the jellyfish is genetically the same, it is not the same jelly that was injured. This is why the distinction of biologically immortal is important: although they may be able to live forever, each jellyfish is not the same jellyfish that shriveled up and formed a new colony. Although his claims seem a little fantastic, he is the only scientist to successfully culture T. dohrnii in a laboratory, reporting that his colony re-birthed itself ten times in two years. He is completely dedicated to this animal, to the point where it spills over into his personal life: after he is done with his research for the day, he performs karaoke songs about jellies that he has written himself, while wearing a jellyfish hat. This is very similar to a disease prevalent in our species: cancer. By studying this mechanism, we may be able to elucidate how the disease spreads, and maybe even figure out a better cure for it! Annam Raza is a recent graduate of University of California, San Diego with a BSc in Environmental Systems- Ecology, Behavior and Evolution, with a focus on marine science.